A healthy vegan carbonara recipe that tastes so indulgent you will think you are digging into a bowl of creamy cheesy pasta! Put the Mori-Nu Silken Tofu, grated garlic, sauerkraut brine, nutritional yeast, red miso paste, smoked paprika, and salt in a blender, and blend on high until the mixture is smooth. Lower the speed to low and slowly add olive oil. Turn off the blender and taste the sauce. Season with more nutritional yeast or salt if needed. Put the mushrooms, smoked paprika, salt and olive oil in a bowl and mix well. 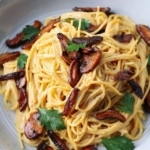 In a large pan over medium high heat, add mushrooms and cook for 10-15 minutes, stirring often, until mushrooms are golden brown and caramelized. Transfer to a bowl and set aside. When the water is boiling, add your pasta and cook according to the directions on the package. We use thin spaghetti which is al dente in 5 minutes. Fill a cup with pasta water and set it aside. Drain your pasta but do not rinse. Return pasta to the pot and pour the carbonara sauce over. Toss well and add mushrooms. Toss well again. Serve topped with fresh parsley. Add pasta water if you prefer a creamier texture. This creamy vegan carbonara pasta will keep refrigerated for up to 4-5 days.